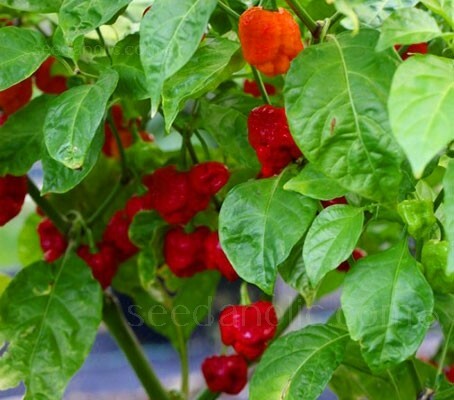 The Moruga is thought to be a cross between the Trinidad Scorpion and Red Savina chilli, once the hottest chilli in the world until it lost its crown to the Ghost, and then the mighty Reaper. This chilli just looks evil to me. Squat with scorpion tail, it’s glossy red skin shouts ‘DANGER, don’t eat me’, the gnarled shape of the fruit, it just looks nasty! 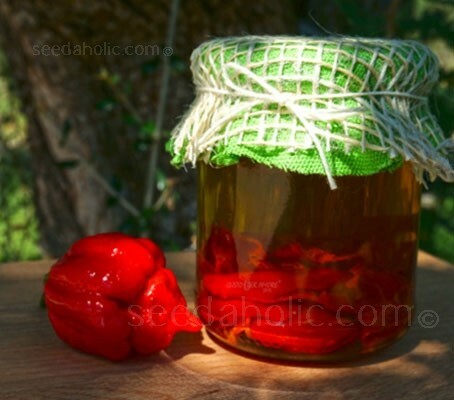 You know this chilli is not to be messed with, and if you’re careless, you may end up red faced….or worse! 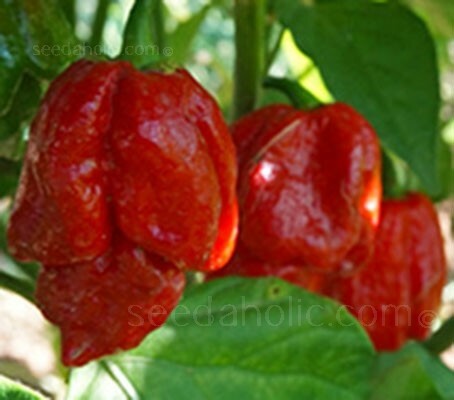 Moruga Red is one of the hottest of the Trinidad Scorpion chillies, which are hotter than the Nagas and other types of superhot chilli. It has been recorded at over 2 million Scoville units, but averages about 1.2 million. Now some of you, like my Mum, will be asking ‘why would you want to grow something so hot?’ Its true that extreme pungency of these chillies limits their culinary value for most people. But aside from the heat, the Trinidad Moruga Scorpion has a rich fruity flavour, sweet with a floral fragrance which makes it a sweet-hot combination that is perfect to add a bit more kick to a home-made hot sauces. The plants need fairly warm conditions to get going, 28 to 32°C (82 to 90°F) would be ideal. Because they ripen so late in the season when light levels are dropping rapidly, plants grown in Northern European cultivation will be a lot less pungent than those from Trinidad. Do not forget your gloves and remember to label your plants. The heat level of this chilli is mega hot. This chilli is 1.2 Million SHU on average and may get top heat hotter than that. So be very careful when handling this chilli. Treat it with the respect that it deserves, remember that the tasting process requires considerable care and always have milk to hand.